Sports are one of the highlights of the day for kids and still a fun way to stay active for adults. But with many sports being perhaps a bit too active when it comes to the safety of your teeth, what can you do to protect your teeth during sports? Prevention is always much easier than dealing with a tooth after it has been knocked out. To do so, most people recommend mouth guards, which can be worn by children or adults. Generally, anyone playing a contact sport such as hockey or football should wear a mouth guard. Even people who play non-contact sports or recreational activities such as skateboarding can benefit from wearing a mouth guard. Mouth guards benefit the user not only by reducing the risk of a knocked out tooth but also by protecting the mouth as well. A mouth guard can reduce the likelihood of injury to the lips, tongue and tissues in your mouth. They also reduce the risk of suffering from nerve damage. There are a number of mouth guards available for your use. You can buy a basic one that is available in most sports shops. They are relatively cheap to purchase and are preformed and ready for your use. The downside is that they can be bulky and awkward. This is due to their single size for everyone, which can make them more uncomfortable to wear. Another mouth guard is a boil and bite protector, which is also available at sports shops. They tend to have a slightly improved fit over the standard, one size fits all mouth guards. These mouth guards are put in hot water, which then softens them. After, you put the guard in your mouth and gently press it to teeth. This action shapes the mouth guard for a better fit. Custom mouth protectors are more expensive but these are considered the gold standard in mouth protection. They are custom designed and fitted at a dentist's office. 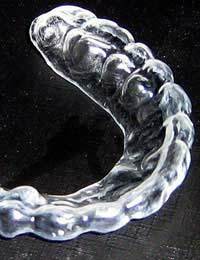 An impression of your teeth is made and then the mouth guard is designed to replicate your teeth precisely. Despite the price, this kind of mouth guard gives you a superior fit and comfort. Each year, many people lose their teeth due to accidents in sports. If you aren't wearing a mouth guard and have a tooth knocked out, there are still ways to save your tooth. More often than not, a knocked out tooth can be re-implanted in the mouth if the conditions are right. Re-implantation of the tooth within only minutes after an accident occurs increases the chances it will be kept for life. If an accident occurs where a tooth is knocked out, it should rapidly be located and should be picked up only by the enamel rather than the root. If the tooth is dirty, it can carefully be rinsed with water or milk but should never be stored in water. For children who have a baby tooth knocked out, it shouldn't be re-implanted as this can harm the permanent tooth bud that is still being formed. This means you should not try to put the tooth back in and instead, should just seek advice from a dentist or a physician if there are other injuries. Overall, there is some debate over the critical time for re-implanting the tooth. The best results are seen if the tooth is put back into the mouth within five minutes of the accident. If a person waits until reaching the dentist's office, the critical time period is long gone and the chances of success are very low for retaining that tooth. Sports are great fun for many people – children and adults alike. Try some of the tips above for protecting your teeth during sports. If injury should occur, make sure you follow the instructions for preserving your tooth and getting emergency dental attention. With the right strategies in place, you can enjoy your sports and protect your teeth in the process.